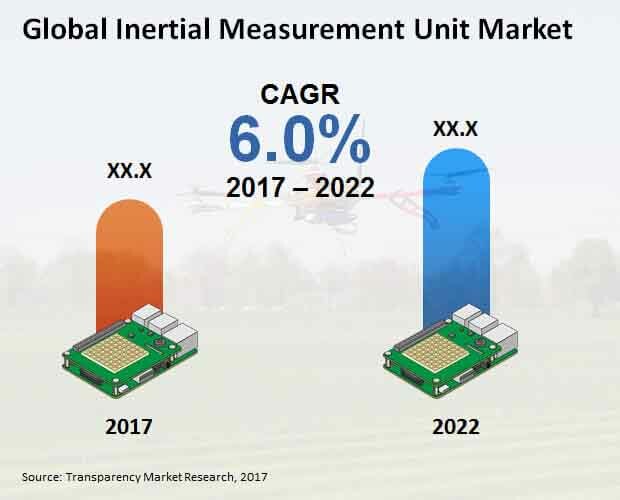 The global inertial measurement unit market is foreseen to rest its hopes on the developments in digital signal processing and microelectromechanical systems (MEMS) technologies. The latest developments in quartz MEMS-based inertial measurement unit could replace aged technologies such as fiber optic gyroscope (FOG) and ring laser gyroscope (RLG) in the coming years since they were not designed for longer use. The new MEMS inertial measurement unit, on the other hand, could effectively operate for longer periods, withstand high vibration and temperature conditions, and prove to function efficiently in underwater applications. Some of the significant factors responsible for the growth of the market could include the growing requirement of more precise navigation, advancement in the MEMS technology, and surging demand for aircraft. The global inertial measurement unit market is foretold to rise at a 6.0% CAGR between 2017 and 2022 to rake in a US$3.6 bn by the final forecast year. In 2017, the market garnered a US$2.6 bn. The international inertial measurement unit market is anticipated to be segmented as per product, where key segments could be gyroscope, accelerometer, magnetometer, and attitude sensor. Amongst these segments, gyroscope could showcase a larger revenue of US$1.8 bn by the end of 2022. Over the course of the forecast period, this segment is expected to exhibit its prominence while growing at an approximate US$0.09 bn annually. This growth could surpass that of any other segment in the category. In terms of platform, the international inertial measurement unit market is predicted to be classified into land, airborne, and naval. According to end use, aerospace and defense, automotive, sports, and other industries could be among the top markets for inertial measurement unit. By sales channel, the international inertial measurement unit market is projected to see a segmentation into direct sales, online retail, electronic component stores, and others. In view of regional segmentation, the world inertial measurement unit market is envisioned to be segregated into Latin America, North America, Europe, Asia Pacific except Japan (APEJ), and the Middle East and Africa (MEA). Japan could be another segment of the market but with a nominal absolute revenue opportunity between 2017 and 2022. However, North America is forecasted to be a greater market for inertial measurement unit, considering its US$1.2 bn revenue prognosticated to be earned by the concluding forecast year. This region could continue to be one of the most attractive ones for the market until the end of 2022. APEJ could be another lucrative region for the world inertial measurement unit market with a 6.7% CAGR prophesied to be registered during the forecast period. Europe could create an opportunity of US$0.2 bn by 2022 over 2017. The MEA could demonstrate a sluggish growth in the next few years. Some of the leading players in the worldwide inertial measurement unit market could be Honeywell International, Inc., Thales Group, Northrop Grumman Corporation, Safran Electronics & Defense SAS, and Rockwell Collins. The global inertial measurement unit market is anticipated to witness growth because of the elevation in the use, procurement, and research of unmanned underwater vehicle (UUV) since the last decade. As a result, there have been telling advances made in a broad scope of UUV payloads such as inertial measurement unit and inertial navigation system. With the help of two chief sensor components, inertial measurement unit could be implemented to collect linear acceleration and angular velocity data as a single unit in the electronics module. The report presents a comprehensive view of the global inertial measurement unit market so as to help players to cement a strong position in the industry for the coming years. The international inertial measurement unit market is envisioned to gain impetus from important applications in high-end guided and automotive missiles, spaceships, autonomous underwater vehicles (AUVs), remotely operated vehicles (ROVs), unmanned aerial vehicles (UAVs), aircrafts, and ships and submarines. Inertial measurement unit could be engaged for effective surveying, guidance, navigation, stabilization, and control in applications such as military, marine, and industrial. The rising employment of UUV for different activities below the seabed could augment the demand for inertial measurement unit. For a number of commercial and military applications such as mine reconnaissance and countermeasures, UUV could be opted as a swiftly developing and choice platform. These applications are expected to possess a high potential in fueling the growth of the international inertial measurement unit market. The demand for inertial measurement unit could increase further with the aggressive growth of unmanned vehicle in defense and civil applications. Other sectors which highly demand inertial measurement unit could be aviation, transportation, energy and infrastructure, and industrial manufacturing. The world inertial measurement unit market is envisaged to be categorized into gyroscope, accelerometer, magnetometer, and attitude sensor, according to product segmentation. As per the analysis of the report, the market for gyroscope could clinch the first spot in terms of revenue share. In 2017, gyroscope secured a share of 50.3%. By platform, the world inertial measurement unit market is prognosticated to be segregated into land, airborne, and naval. As per end use, the analysts foresee opportunities offered by segments such as aerospace and defense, automotive, sports, and other industries in the world inertial measurement unit market. According to sales channel, the world inertial measurement unit market is prophesied to be classified into direct sales, online retail, electronic component stores, and others. By geography, Latin America, North America, Europe, Asia Pacific except Japan (APEJ), Japan, and the Middle East and Africa (MEA) could be key segments of the world inertial measurement unit market. The authors of the report profile some of the top-scoring players of the worldwide inertial measurement unit market, viz. Honeywell International, Inc., Thales Group, Northrop Grumman Corporation, Safran Electronics & Defense SAS, Rockwell Collins, Systron Donner Inertial, KVH Industries, Inc., Moog, Inc., Fairchild Semiconductor International, Inc., and Kearfott Corporation.